This paper reports on part of the first phase of a longitudinal project investigating the development of academic language in English as the Language of Teaching and Learning (LoLT) by Foundation phase learners in two different educational contexts. In the first context, the learners were all English additional language (EAL) learners taught by EAL teachers. In the second context EAL and English first language (L1) learners were taught by L1 teachers in integrated classes. The three groups of Grade 1 learners were assessed on the semantic subtests of the Diagnostic Evaluation of Language Variation Criterion, Referenced Edition, which evaluate the psycholinguisticprocessing skills underlying lexical acquisition and organization. Vocabulary learning is central to the development of academic language and literacy. There were statistically significant differences between the three groups on all measures. The EAL learners in the first context had significantly lower scores than the EAL and L1 learners in the second context, and the EAL learners in the second context had significantly lower scores than their L1 peers. Pre-school exposure to English and gender did not have significant effects, except on the subtest assessing fast mapping of novel verbs. The results provide information on what can reasonably be expected from EAL learners in Grade 1, suggest language skills that can be addressed to support the learners, and have implications for language in education practices with EAL learners in different educational contexts. It is widely acknowledged that language competence is central to educational success (Westby, 1994; Bashir, Conte & Heerde, 1998; Owens, 2008; Hoff, 2005). One of the theoretical concepts considered to be central to school age language learning is the notion of academic language proficiency, defined as "access to and command of the oral and written academic registers of schooling", in contrast to basic, social conversational fluency(Cummins, 2000:67). The development of academic language is one of the primary goals of education, since it underlies literacy, mathematics, and meaningful engagement with the subject matter at all levels of education (Gersten, Baker, Shanahan, Linan-Thompson, Collins & Scarcella, 2007). However, it is not acquired as naturally as the social-communicative functions of language and develops through formal instruction (Cummins, 2000). This study focused on one aspect of academic language development, namely, semantic processing, which is essentially about the expression and understanding of meaning and also refers to lexical acquisition (De Villiers, 2004), which plays a particularly important role in reading comprehension (Linan-Thompson & Ortiz, 2009). The semantic processing skills that aredeveloped during the foundation phase include: growth in conceptualization and knowledge of word formation processes as well as the increasing ability to learn new words from context, a skill known as fast -mapping (Hoff, 2005). There is research to show that the acquisition of these skills can be facilitated through vocabulary teaching and assisting children to make use of context to acquire new words (Maynard, Pullen & Coyne, 2010). Gersten et al. (2007) maintain that such instruction should begin in the foundation phase. These authors believe that with adequate support, academic language can be acquired by all children, irrespective of the medium of instruction. However, there is evidence to suggest that some teachers in South Africa lack the methodological skills to promote effective learning of academic language (Meier, 2005; Chisholm, 2004; Uys, Van der Walt, Van den Berg & Botha, 2007; O'Connor & Geiger, 2009), perhaps because they have not had the necessary training in educational linguistics (Reagan, 2009). Educational linguistics is defined by Wong-Fillmore & Snow (2000) as the study of how language functions in various aspects of education. Agood grounding in educational linguistics can support educators' work, particularly in teaching literacy and working with EAL learners. Since the literacy levels of South African schoolchildren is currently of serious concern (Tyobeka, 2006; Taylor & Yu, 2008; Howie, 2009; Webb, Lafon & Pare, 2010), research on the acquisition of semantic language skills in this context is critical. In addition and perhaps the most compelling reason for investigating academic language development within the South African education system is the fact that many learners must accomplish this in a second or additional language. As a result of our history and the sociolinguistic influences operating within the country and by extension in education, this language is most often English (Brock-Utne & Skattum, 2009). Education through the medium of English is widely implemented despite international (Genesee,1999; Kindler, 2002; Thomas & Collier, 1997, 2002) and South African (Malherbe, 1977; Ianco-Worrall 1972; MacDonald, 1990; Heugh, 2000; Rademeyer, 2005) research evidence for the more effective development of academic language in the learners' L1 or, alternatively, through bilingual instruction. However, the implementation of home language instruction has made slow progress (Mda & Mothata, 2000; Pandor, 2005), and the majority of South African parents aspire to have their children educated in English, because they believe it is the language of empowerment (Kamwangamula, 2000). Furthermore, at a language colloquium in Cape Town a former minister of education acknowledged that too few teachers have been adequately prepared to teach in English and insufficient resources have been made available to give effect to the home language policy (Pandor, 2005). Particularly in Gauteng province, where there is marked heterogeneity in the language backgrounds of learners, and teachers and learners do not speak the same home languages, English is inevitably adopted as the Language of Learning and Teaching (LoLT) (Granville, Janks, Joseph, Mphalele, Ramani, Reed & Watson, 1997). Limited research has been conducted on the development of academic language proficiency by South African learners specifically at the Foundation phase level. A recent study by Kallenbach (2007) applied the same measure as the one used in this study to Grade 1 EAL learners in three schools similar to the context 1 type school participating in the current study, i.e. schools attended by only EAL learners who were taught by EAL teachers. One of the implications of Kallenbach's study was to compare the performance of these EAL learners to that of a peer group, who were integrated with L1 learners. Therefore, this is what the current study aimed to do. The research was conducted in two contexts where English is used as the LoLT from the first grade. Both have evolved from the former Model C system, mainly because of migratory patterns in the urban population since the advent of democracy in 1994 (Sekete, Shilubane & Moira, 2001). The two contexts are outlined in Table 1. In the first context, all the children are English Additional Language (EAL) learners and are taught by EAL teachers, who are able to speak some of the languages represented in their classes. In the second context, the student body has since 1990 become multiracial. First and additional English language learners are integrated in the same classes in varying proportions and the majority of teachers at these schools speak English as a first language. This study compared the semantic processing skills of Grade 1 learners in these two contexts since there are potential advantages and disadvantages to each. In the first context, the researcher was interested in assessing the effects of certain anticipated advantages, including the fact that the children learn at a pace that is conducive to the whole class of EAL learners who are at a similar level of English language development (Wong-Fillmore, 1985) and the teachers may be sensitive to the needs of EAL learners since they are also EAL speakers (Cook, 2007). In addition, they can speak some of the first languages of the children in their classes and are thus able to adopt a multilingual approach in which concepts are taught using the children's home languages. This approach has been strongly advocated in South Africa (Heugh, Siegrühn & Plüddermann,1995). Possible disadvantages in this context may be that the teachers are not able to teach as effectively in English and the EAL children are not exposed to L1 models in the academic setting. In the second context, EAL children are taught in classes with English first language (L1) learners by teachers who speak English. This implies that they are required to learn in English only and must compete with children who speak English as a home language. They are not able to use their home languages to support the learning of English and this may affect their rate of learning (Genesee, 1999; Heugh, 2000). The advantage of this context is that the L1 teachers and learners provide first language models for the EAL children. According to Scarcella (2011), children learn academic language from those with whom they associate. There is also research to show that young children learn language from each other and that it may be beneficial for EAL and L1 children to be taught together (Genesee, Lindholm-Leary, Saunders, & Christian, 2006). Typically, the assessment of language is a difficult task, as language is multi-dimensional, and not easily measured. In the academic environment, teachers generally evaluate learners according to criteria based on the content of their language and not the psycholinguistic processes that underlie language development. In this study, the processes supporting lexical development were assessed using the semantics subtests of the Developmental Evaluation of Language Variation Criterion Referenced edition (DELV-CR) (Seymour, Roeper & de Villiers, 2003). The selection of this instrument was based on its theoretical foundations in psycholinguistics, its ability to capture the language developments typically observed in young school aged children and its alignment with some of the language outcomes in the South African foundation phase national curriculum statements. According to De Villiers (2004) the DELVCR is specifically designed to tap many of the language skills important for early schooling and literacy acquisition, which makes it appropriate for assessing emerging academic language. The DELV-CR draws on theories of the universal properties and processes of language (Seymour et al., 2003), and was developed primarily to address cultural and linguistic assessment bias against speakers of the African American English (AAE) dialect, but this is not the primary reason for using this measure in this study, since AAE is not necessarily comparable to dialectal variations in either first or second language speakers of South African English. Rather, the appeal of the DELV-CR lies in the fact that in the process of avoiding dialectal features and ensuring culture fairness, the test was designed and constructed in a practical way "to assess underlying processes common to all varieties of English" (Seymour et al., 2003:4). In addition, the test items and picture stimuli contain situations, activities and people from different cultural and ethnic backgrounds, which increase its applicability to the South African context. The DELV-CR was field tested on 1,014 4-9,11 year old children from working class backgrounds in all regions of North America and is thus applicable to the participants of this study, who were 7-8 years old at the time of assessment. 1. To compare the language skills of learners in each class at each school within each context since they were taught by different teachers who may have different levels of qualification, experience, and methods of teaching which could potentially affect the learners' performance. 2. To compare the language skills of learners with limited and extensive exposure to English in the pre-school period, since the quantity and quality of exposure to an additional language plays a significant role in its acquisition (Genesee, Paradis & Crago, 2004). Prior exposure to English was determined from questionnaires completed by the parents of the learners participating in the research. 3. To compare the language skills of grade 1 EAL and L1 learners, who provided a comparative group of South African children in a similar education system. This was to avoid comparing the EAL children to the American criterion group participating in the development of the DELV-CR. Such comparison would be biased due to the different cultural environments and education systems in the USA and South Africa. 4. To compare the performance of male and female participants within each educational context, since there is a significant body of research to suggest that there are gender differences on most cognitive processes including language (Halpern, 1992; Tartre, 1990; Schutte, 1998; Westen, 1999). The design was quantitative, descriptive, cross sectional, and comparative in nature. The study was descriptive in that there was no experimental manipulation of variables and cross-sectional since data were collected at a single point in time. The advantage of a cross-sectional design is that a larger group can be researched at the same time therefore making the study cost-effective and improving the generalisability of results (Schiavetti & Metz, 2006). Both between and within group comparisons were conducted. Three groups of learners (EAL learners in context 1, EAL and L1 learners in context 2) were compared to each other on all the language measures. Within group comparisons were conducted to compare classes within each group and to compare the males and females and the two different exposure groups within the EAL groups. The learners did not present with physical, cognitive, hearing, or visual impairments, which could affect language development. This was established on the parent questionnaire and through school records. All participants were at the end of their Grade 1 year at the time of testing, to ensure sufficient exposure to English in an academic environment to cope with the assessment measure. To comply with the formal definition of second language acquisition (Genesee et al., 2004), the EAL participants were children who had acquired English as an additional language after the age of three, irrespective of the exposure to other languages prior to this. It is acknowledged that the participants may have been exposed to English in the home and pre-school environment before the age of three as many families use some English to communicate, particularly if there are siblings who attend English schools. The EAL participants were divided into two exposure groups: those in exposure group 1 had attended an English preschool for less than a year, while those in exposure group 2 had attended an English pre-school for more than a year. The L1 participants were children who spoke only English, as confirmed on the parent questionnaires. In consultation with the Gauteng Department of Education, the first group of EAL participants was purposively selected from one school where all the learners are EAL and are taught by EAL teachers throughout the Foundation phase (context 1). The second group of EAL learners and the L1 learners were selected from three schools where EAL and EFL learners are integrated in the same classes and are taught by L1 teachers (context 2). Information sheets and consent forms were distributed to all the parents of Grade 1 learners at each school, and those children whose parents gave informed consent for their participation were considered for inclusion in the study, provided they met the criteria for selection. The response rates at the four schools varied from 60-75%. The four schools were all suburban public schools in close geographical proximity to each other in the eastern district of Johannesburg and are attended by children from a variety of socio-economic backgrounds. The selection of children from these schools was intended to ensure as far as possible, that there would be similar numbers of children from different socio economic backgrounds in each context. The reality of the South African situation is that many suburban schools are attended by children from working class and poor families who reside in the inner city areas, townships and informal settlements around the cities and send their children to schools in the suburbs, which are perceived to be better schools and most importantly, offer instruction in English. Participants were selected from three classes at the first school, four classes at the second school, and one class at the third and fourth schools, respectively. There were 70 EAL participants in context 1, with 48 EAL and 51 L1 participants in context 2. There were 35 EAL participants in each exposure group in context 1, but in context 2 there were many more participants in exposure group 2 (n = 34) than in exposure group 1 (n = 14). This may be because the learners in context 2 are placed in the same classes as L1 peers, thus creating a perceived need for more exposure to English in the pre-school period, which the parents then provide for. The gender groups were more balanced across the three groups, with 38 males and 32 females in context 1, 19 male and 29 female EAL participants and 25 male and 26 female L1 participants in context 2. Table 2 provides a further description of the participants in terms of age and home language, as reported in the parent questionnaires. It also indicates the language(s) spoken by the teachers of each class. 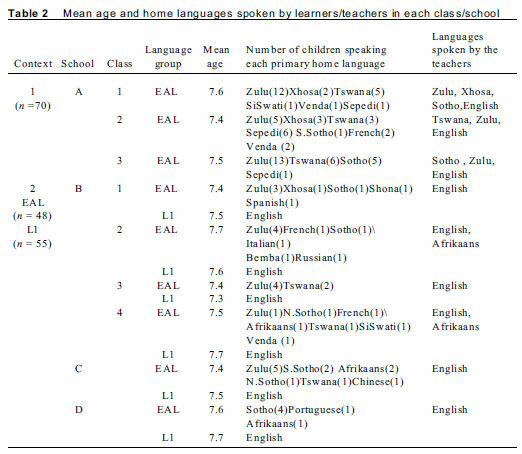 The information in Table 2 indicates that all the participants were between 7.3 and 7.7 years of age at the time of testing, and that as anticipated, a significant number of different home languages were spoken by the EAL children at each school. It also confirms that the teachers in context 1 were all EAL speakers, while the teachers in context 2 were all L1 speakers. The EAL teachers in context 1 all reported that they speak English fluently and that they use the learners' home languages for explanations when they are able to. All the teachers reported that they use small-group teaching, demonstrations and concrete visual aids to assist the EAL learners with English vocabulary learning.  Years of pre- school exposure to English in the case of EAL learners. The verb and preposition contrast items examine vocabulary organization (Seymour et al., 2003). The ability to organise words flexibly for efficient retrieval is a skill that develops throughout the school age years (Aitchison, 1987; Anglin, 1970). The DELV-CR assesses verb organization because verbs are less influenced by cultural variation than nouns; verb meanings are central to language development (Tomasello & Merriman, 1995); and verb lexicons have been shown to be vulnerable in language impaired children (Rice & Bode, 1993). The verbs examined in the DELV-CR include those expressing: motion, grooming, breaking, corresponding, and dressing (Seymour et al., 2003). The child is shown a picture and is required to provide a verb to complete a stimulus sentence (Seymour et al., 2003), e.g. "The man isn't walking, he's .............. crawling". Preposition organization is also tested because there is a limited set and prepositions are less variable across different dialects of English. The purpose of this subtest is to examine the child's skill in producing spatial and grammatical prepositions that are contrastive to the ones used in the prompts (Seymour et al., 2003). The child is shown a picture, and is then required to complete a sentence about the picture using a preposition (Seymour et al., 2003), e.g. "She's not looking at the radio she's listening ........... to the radio". Quantification is based on the connection between word meaning and logic. It is found in all languages and also occurs in the language of mathematics. This sub-test utilises the term 'every', as it is one of the most frequently occurring quantifiers. The child's understanding of quantifiers provides insight into how well his/her developing grammar can manage the complex constructions used in everyday discourse (Seymour et al., 2003). This subtest consists of eight items, three of which analyse the child's understanding of the meaning of 'every' and the syntactic constraints that govern its use. For these items , the child is shown a picture and asked to indicate if the picture can be described by the word "every" (e.g. the child is required to respond to the question: "is every woman sailing a boat? " when shown a picture of four sailboats, three with a woman in and one woman sitting on the beach). A further three items assess the child's understanding that 'every' modifies the noun that follows it (e.g. the child is shown a picture of a man throwing a ball to four boys and another picture of the same four boys each throwing a ball to the same man. The child is required to point to the correct picture in response to the stimulus sentence: "The man watched every boy throw a ball"). The last two items analyse the child's understanding of the syntactic constraints that regulate the production of 'every' across sentence boundaries (e.g. the child is shown two pictures, one in which a boy is watching three dogs each scratching their ears and one in which the three dogs are watching the same boy scratching his ear. The child is asked to point to the correct picture in response to the stimulus: "The boy saw every dog. He scratched his ear"). Fast mapping is a language skill found in all children regardless of cultural or linguistic background. Learning verbs in particular, is highly dependent on understanding grammar and interpreting sentence context. It is also a skill that is required in the classroom when acquiring new vocabulary. The fast mapping sub-tests examine the child's ability to derive the meaning of an unfamiliar word from the context it is used in. The first group of items included in this sub-test, teaches the child the task by using real verbs in the prompt. The second group of items makes use of novel verbs. For each item, the child is provided with a series of three pictured episodes, while the test administrator expresses an action (e.g. Real verb: "The boy is pouring juice. Novel verb: "The girl is zanning the apple to the clown." The child is then expected to respond to a number of questions about the characters and objects in the series of pictured episodes, by pointing to one of four smaller pictures, placed to the right of the main picture (e.g. "Who is the pourer?" "What got zanned?"). These smaller pictures relate to the characters or objects depicted in the original set of three pictures, but do not provide the content needed to respond correctly. The child is required to use what he/she understands about word order and word endings to arrive at the correct answer. The verbs used in this component consist of three variations: transitive verbs, transfer verbs, and complements (Seymour et al., 2003). Each participant was individually assessed in a quiet room, on the school premises by research assistants who had been trained by the principal researcher in standard administration and scoring of the entire DELV-CR test, as specified in the manual. The test took approximately 20 minutes per child. Although the participants were constantly encouraged to remain focused throughout the testing, they were not informed whether their responses were correct or incorrect as they will be re-assessed on the same test at the end of their Grade 2 year, as part of the ongoing longitudinal study. The testing at the four schools took place during November 2008 and was completed within 12 days. The Ethics Committee for Research on Human subjects, University of the Witwatersrand, approved the study (Protocol No. H070311). Approval was obtained from the Gauteng Department of Education (GDE) to conduct the research in an educational setting. In addition, informed consent was obtained from the principals and teachers of the selected schools. Due to the fact that the participants in the study are under the legal age of 18, informed consent was obtained from their parents/legal guardians. Assent was obtained from the children concerned (Greig & Taylor, 1999). The information sheets and consent forms included details regarding the general purpose of the study and the voluntary nature of participation in the study were emphasized. In addition, confidentiality and anonymity of responses and results was assured. Participants were assured that they could withdraw from the study at any time. The scores obtained by each child, for each item on the test, were entered onto spreadsheets. These spreadsheets contained the name of the child, the school attended, the class, gender, EAL or L1 status, and whether the child was in exposure group 1 or 2, in the case of the EAL children. Statistical comparisons were performed using the SAS 9.2 computer system. Within group comparisons were conducted using a one way analysis of variance to compare the classes within each group. The gender comparisons within each group and the exposure group comparisons within the EAL groups were also completed using one way analyses of variance (Schiavetti & Metz, 2006). The analysis of variance procedure yields an F value which the computer programme compares to a tabulated value to establish the probability level at which the differences between or within groups are significant. 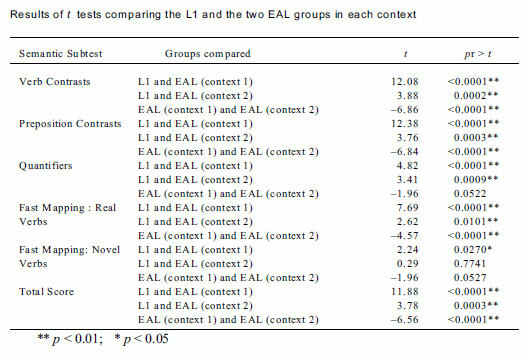 The between group comparisons, which was done using independent sample t tests (Schiavetti & Metz, 2006), revealed whether there were significant differences on any of the measures between the two groups of EAL learners and between each of the two EAL groups and the L1 group. All statistical comparisons between and within groups were deemed to be significant if the probability of rejecting the null hypothesis (i.e. that the differences were not significant) was less than 5% (i.e. p < 0.05). The statistical comparison between the classes within each group revealed very limited evidence that specific teachers within each context had an effect on the children's semantic processing skills. Within the L1 group there was a significant difference between classes (F = 2.64; pr>F = 0.0233) on the fast mapping of novel verbs subtest. This was because there were two classes in the L1 group who did better than the other classes on this subtest. This is felt to reflect particularly good fast mapping skills among some of the L1 children, rather than specific teacher effects because it is unlikely that any of the teachers would have taught fast mapping skills using novel verbs. There were also significant differences between classes in the EAL group in context 1, on the verb (F = 3.67; pr>F = 0.0307) and preposition contrast (F = 3.28; pr>F = 0.0439) items. It is possible that one or even two of the three teachers at the school in context 1 had taught the children verbs and prepositions, but since classroom observations were not conducted, it is not possible to substantiate this inference. There were no other significant differences between the classes within any of the groups and the data were thus converged into three groups for the comparison of educational contexts. The mean scores (in %) obtained by each group on each measure of the semantic subtest are reflected in Figure 1. The L1 group did relatively well on the test obtaining mean scores between 70 and 92%, except on the fast mapping of novel verbs (NVFM) subtest where they obtained only 51.2%. They obtained an average total score of 72.5% on the test. Although this suggests that their semantic processing skills are not fully developed, it does indicate that children, who have developed English as their home language, have relatively good semantic processing skills to support the acquisition of academic language. The EAL group in context 2, who were in the same classes as the L1 learners, obtained mean scores between 60 and 79% on all subtests except fast mapping of novel verbs (NVFM) on which they obtained a mean score of 50.8%. The EAL group in context 2 obtained a total mean score of 63% on the semantic subtest, which is lower than that of their L1 peers. The EAL group in context 1 obtained mean scores below 50% on all the subtests except the quantifier subtest, on which they obtained a mean score of 64.1%. They obtained an average total score of 47.4% on the semantics test, which is below that of their EAL and L1 peers attending the context 2 schools. The results obtained by the EAL group in context 1 are very similar to those obtained by participants in the study by Kallenbach (2007). In her study, the learners obtained mean scores of 61% on preposition contrasts, 63% on the quantifier subtest, 24% on verb contrasts, and 45 and 42 % on fast mapping of real and novel verbs respectively, with an average total score of 44% . The performance of the EAL learners in context 1 was thus consistent with that of the EAL children in the same type of context in Kallenbach's research, which suggests that their results were reliable. In the current study, the profile of performance was the same for all three groups in that they did better on the preposition contrasts (Prep con) and quantifier subtests than on verb contrasts (Verb con) and fast mapping of real verbs (RVFM). The results of the statistical comparisons are reported in the Appendix. They show that the differences between the L1and EAL learners in both contexts 1 and 2 were highly significant (p > 0.0001) on all the semantic subtests, with the exception of the fast mapping of novel verbs subtest where the differences between the L1 learners and their EAL classmates in context 2 and between the two EAL groups were not significant. It thus appears that all the participants found fast mapping of novel verbs difficult, although the L1 learners still did significantly better than the EAL learners in context 1. The value of fast mapping is that it enables learners to depend on their understanding of grammar and context to interpret the meaning of verbs in a sentence (Gleitman, 1990). It is important for vocabulary learning (Seymour et al., 2003) and the ability to fast map novel words is particularly important to EAL learners in the academic environment, as they are continually exposed to unfamiliar words. Difficulty with fast mapping skills therefore, impacts on the learners' ability to understand what they hear and read. There were significant differences between the three groups on the fast mapping of real verbs, as well as on the verb and preposition contrast subtests with the L1 learners doing significantly better than both groups of EAL learners, and the EAL learners in context 2 doing significantly better than the EAL learners in context 1. The verb and preposition contrast items assess the organization of the lexicon. This is an important skill because no matter how different children's experiences and subsequent vocabulary are, the lexicon must be organized in a hierarchical pattern for efficient retrieval of words (Seymour et al., 2003; Capone & McGregor, 2003). Adequate semantic networks are essential to reading comprehension and word retention and recall (Nicolosi, Hayman & Kresheck, 1989). Both groups of EAL learners demonstrated significantly poorer skills than the L1 group in the hierarchical organization of their lexicons for verbs and prepositions and the EAL learners in context 2 were significantly more skilled than those in context 1. Both groups of EAL learners could thus benefit from direct instruction on verb and preposition organization. This would involve teaching these concepts in a contrastive way (e.g. walking vs crawling; on vs under). 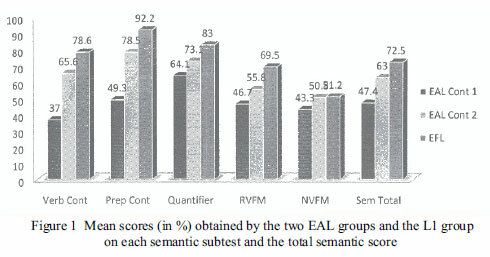 The L1 learners did significantly better than both groups of EAL learners on the quantifier subtest, but the difference between the EAL learners in contexts 1 and 2 was not significant, indicating that the learning context did not have a significant effect on the EAL learners' ability to understand the quantifier "every". The EAL learners in context 1 obtained a mean score of 64.1% on this subtest and the EAL learners in context 2 obtained a mean score of 73.1%. Since this was also the subtest on which the EAL group in context 1 obtained the highest mean score, it is possible that they had learned something about the quantifier "every" from the instruction they had received, perhaps in the numeracy learning area. A secondary aim of the study was to assess the effects of exposure to English in the pre-school period on the scores obtained by the EAL children. There was a significant difference between the exposure groups on the fast mapping of novel verbs subtest in the EAL group in context 1 only (F = 3.98; pr>F = 0.050) with participants who had more exposure to English (Exposure Group 2) doing better than those who had less exposure (Exposure Group 1). No other significant differences between the exposure groups were noted. It is possible that exposure to English in the pre-school involved only communicative language and not academic language and hence the length of attendance at an English pre-school did not have a significant effect on the results. Fast mapping of novel verbs seems to be the only skill that differentiates EAL learners with more and less exposure to English. A further aim of the study was to assess the effects of gender on the scores obtained on the semantic subtests of the DELV-CR. There were no significant differences between males and females on any of the measures in any of the groups, with the exception of fast mapping of novel verbs (F = 4.51; pr >F = 0.0399) in the EFL group, where the girls did significantly better than the boys. Again, fast mapping, particularly of novel verbs, seems to be most sensitive to differences in language learning ability. This study investigated only the semantic aspects of language processing. Although the tests also indirectly assessed the influence of syntax, because it is never possible to separate the components of language completely (Owens, 2008), the results refer only to a limited set of language skills involved in academic language, and should be interpreted as such. The significant differences between the EAL and L1 learners suggest that at a Grade 1 level, children who are learning in an additional language are not at the same level of language processing as their monolingual peers and need support in the acquisition of vocabulary. Even when EAL and L1 children are integrated and taught by L1 teachers, specific skills need to be developed for the EAL children. This is indicated by the significant differences between the EAL and L1 learners in context 2. In this context, the L1 children would also benefit from a "language-rich diet" (Clegg, 1996:12). The significantly lower scores obtained by the EAL learners in context 1 when compared to their EAL peers in context 2 suggest strong contextual effects on the development of semantic processing skills in Grade 1. The implication of the better performance by the EAL learners in context 2 is that integration of EAL and L1 learners is beneficial if English is to be used as the LoLT, but since less than 10% of the South African population speak English as an L1, it is not realistic to propose that all EAL learners should be integrated with L1 learners and taught by L1 teachers. There are a number of possible explanations for the significantly poorer performance by the EAL learners in context 1. First, it would seem that the anticipated advantage of having EAL teachers, who understand the needs of EAL learners and can use the L1 to support the learning of English, is not necessarily sufficient to develop the semantic processing skills of the learners. Second the EAL learners in context 1 were not exposed to L1 models in the classroom and since it has been shown that children learn language from each other (Genesee et al., 2006) and from those with whom they associate (Scarcella, 2011), it is likely that this had an effect on their language development. Third, although the comparison between L1 and EAL teachers is regarded as a sensitive issue (Garcia-Lecumberri & Gallardo, 2003), it is possible that different teaching practices and/or levels of English proficiency had an effect on the results. However, in the absence of controlled classroom observations in this study, this explanation remains speculative. Fourth, the selection of participants from schools in the same geographical catchment area was intended to control for the effects of varying socio-economic status, but one cannot exclude the possibility that there were more EAL children in context 1 from lower socioeconomic backgrounds. Lower socio-economic status can have a significant negative impact on language development (Owens, 2008; Hoff, 2005). Irrespective of the reasons for the poorer performance of the EAL learners in context 1, the most important question arising from the findings is whether these children would not derive more benefit from instruction in their home languages. Although this poses practical problems in that the classes were highly diverse in terms of home language background, the provision of home language instruction is regarded by many as the most obvious solution to the problems surrounding language in education practices and their effects on educational achievement (Heugh, 2009; Alexander, 2010; Webb et al., 2010). However, the effects of language in education practices are not straightforward and the use of English as the LoLT with EAL learners is not the only reason for underachievement. Reddy, Kanjee, Diederiks & Winnaar (2006) and Fleisch(2008) argue that the quality of teaching, which in South Africa is often influenced by limited subject knowledge, low teacher expectations and consequently low cognitive demand in the classroom, irrespective of the language of instruction, also play a major role. In addition, home language instruction in the African languages is a highly contested issue (Heugh, 2000). Webb et al. (2010) propose a number of reasons for this. First, there is a general tendency for African language learners and teachers to over-estimate their proficiency in English, and under estimate their home language proficiency. Second, the African languages have not been adequately developed and standardized, and although there has been work in this area by the National Languages Bodies under PANSALB, the standardized varieties have not been widely accepted, are not familiar to L1 speakers and are not used in formal contexts such as classrooms. The development of technical terms in the African languages is challenging in that there is considerable difficulty in finding terms for concepts and the translation of English terminology is considered problematic in that English and the African languages are non-cognate languages. The third reason for the non-use of African languages in education is the increasing use of urban, code mixed vernaculars such as Tsotsitaal, Iscamtho and Pretoria Sotho in Gauteng schools in particular (Lafon, 2005; Cook, 2008). Webb et al. (2010) attribute this practice to the absence of well-developed standard languages, and the rejection of standard varieties by particularly the urban youth. One may argue that given enough time, the EAL learners in this study will catch up to their L1 peers. Their development will certainlybe captured in the ongoing longitudinal project of which this study was only the first part, but questions nonetheless arise regarding the effects of such a protracted period of oral language development on literacy attainment. The implication is thus that reading comprehension skills in particular, should be assessed at the next phase of this project, when the learners are at the end of the Grade 2 year. It would, however, be unwise and unethical to adopt a "wait and see" approach and learner support should not be withheld. Although this study refers to the acquisition of English, the principles of semantic processing and vocabulary acquisition can be applied to other languages, and the findings thus have relevance for the use of any language used as the LoLT or taught as a subject for that matter. In the final analysis, if we acknowledge that one of the primary goals of education is to develop academic language, so that learners may engage meaningfully with the content and subject matter across the curriculum at all stages of the process, language teaching policies and practices within a multilingual context must be sharply honed, particularly in the foundation phase when the process begins. Without adequate attention to the importance of language teaching practices in all educational contexts, it is likely that current inequalities in education will be perpetuated. I thank the children, teachers, parents, and principals of the schools participating in this research, the students who assisted with data collection, and my son for his assistance with the statistical analysis. This material is based upon work supported financially by the National Research Foundation. Heila Jordaan is Senior Lecturer in the Department of Speech Pathology and Audiology, School of Human and Community Development, University of the Witwatersrand. Her research focus is on language in education in multilingual contexts. She has 25 years of teaching experience.